Two emerging enterprises founded by local students in the Mayo Gaeltacht areas have been crowned joint winners of the Údarás na Gaeltachta - Clár Comhlachta Mayo Regional Final. After an intense day of competition, hosted in Arás Inis Gluaire, CPA Woodwork from Coláiste Pobail, Acla and Cluasáin Clúdaithe from Scoil Mhuire, Béal an Mhuirthead were chosen to progress and represent their region in the national final of the Údarás na Gaeltachta – Clár na gComhlachtaí. 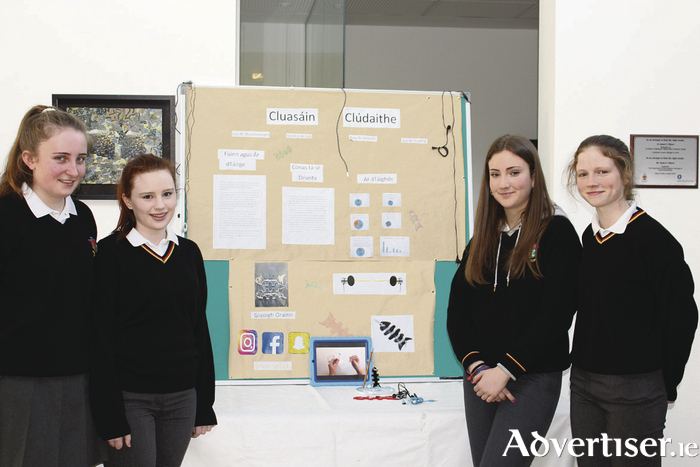 Cluasáin Clúdaithe came up with their idea as everyone in their company had the same problem - when they put their earphones into their pockets during school, they became tangled and would eventually break. They decided to create a product that would help avoid this and designed a fish bone shaped earphone holder that you can wrap your earphones around, to stop them from tangling. It is made of perspex plastic which is a light material and is available in many colours. The students in CPA Woodwork used skills learned in their favourite subject, to design tealight holders from wood, for various occasions. Heart shapes for Valentine's Day and shamrock shapes for St Patrick's Day have been among the popular sellers for them and they can create a shape for any occasion. Clár na gComhlachta is a hands-on business learning experience developed and delivered in partnership with Junior Achievement Ireland (JAI ) and is taught by business volunteers through the Irish language to students in Gaeltacht regions. Five hundred transition year students from Gaeltacht regions all over the country have participated this year and challenged themselves to create, operate and manage their very own business. The programme provided students with numerous opportunities for the development and reinforcement of important business, academic and leadership skills, which will be invaluable to them in the future. The judging panel, comprising Seán Ó'Coisdealbha, Údarás na Gaeltachta, and Claire NicOireachtaigh, Coláiste Uisce, was thoroughly impressed with the entrepreneurial flair and particularly the level of preparation invested by the students, their teachers and business mentors to ensure they presented their enterprises in the best possible light. The two winning teams will join other regional final winners to participate in the Údarás na Gaeltachta – Clár Comhlachta National Final which will be held in the Connemara Coast Hotel, Galway on Wednesday.